Between October 1st and November 13th 2015 the Volterra-Detroit Foundation participated in the Give Detroit Challenge organized by Crowdrise. We did it with a very specific goal in mind: to raise funds to start a new program, the Volterra Artist in Residence Fellowship. The six week campaign was generously supported by many of you, who believed in us, and our purpose. We didn’t just do well in the challenge, we did fantastically! We raised 95% more funds than our initial goal; we finished in 7th place out of 50 participating non-profits. It was an amazing experience, and a great adventure. Lots of great moments to remember. As soon as the dust settled after the last bell of the challenge, we sat down to work. Your trust was our inspiration. We had the ambition to send the first Detroit artist to Volterra in the Fall 2016. We planned and learned. We received a lot of help from some amazing people, with extensive knowledge of the Detroit art community. They helped us to refine our program objectives, and to design an appropriate and fair selection process. The Volterra-Detroit Foundation is pleased to announce the winner of the 2016 Volterra Artist in Residence Fellowship: Ms. Tiff Massey. Ms. Massey will reside in Volterra for eight weeks, in September and October 2016. She will live at the Volterra International Residential College. During the program she will have an opportunity to collaborate with local artists to share and develop their artistic vision, and to form lasting bonds of friendship. The residency program will conclude with exhibitions and presentations in Volterra and Detroit. Tiff Massey is a mixed-media artist from Detroit, Michigan. She holds an MFA in metalsmithing from Cranbrook Academy of Art, and a BS in Biology from Eastern Michigan University. Her work, inspired by African standards of economic vitality, includes both large-scale and wearable sculptures. 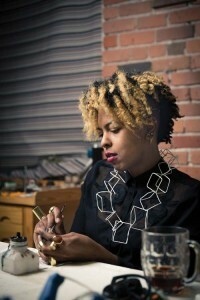 Massey counts the iconic material culture of 1980’s hip-hop as a major influence in her jewelry. She uses contemporary observances of class and race through the lens of an African diaspora, combined with material drawn from her experience in Detroit. Tiff Massey is a 2015 Kresge Visual Arts Fellowship awardee as well as a John S. and James L. Knight Foundation’s Knight Arts Challenge winner, and was recently recognized as a Michigan Chronicle 40 Under 40 award recipient. A staunch advocate for Detroit’s artist community, Massey has served on numerous panels including the Detroit Institute of Art’s Friends of Modern Contemporary Art Lecture series: Which Side Up – Packing/Unpacking-Detroit Responds. Tiff Massey’s work has been widely exhibited in both national and international galleries. The Volterra Artist in Residence Fellowship Selection Committee named also Ms. Desiree Cooper the Finalist of the program. 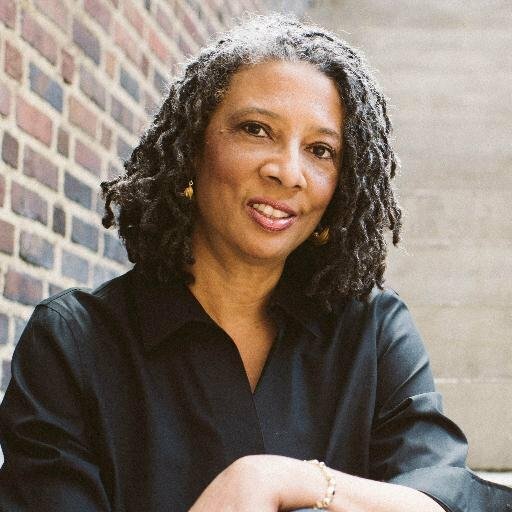 A 2015 Kresge Artist Fellow, Desiree Cooper is a former attorney, Pulitzer Prize-nominated journalist and Detroit community activist whose fiction dives unflinchingly into the intersection of racism and sexism. Using the compressed medium of flash fiction, she explores intimate spaces to reveal what it means to be human. Her fiction and poetry have appeared in Callaloo, Detroit Noir, Best African American Fiction 2010, and Tidal Basin Review, among other online and print publications. Her first collection of flash fiction, Know the Mother, was published by Wayne State University Press in 2016. Cooper was a founding board member of Cave Canem, a national residency for emerging black poets. She is currently a Kimbilio fellow, a national residency for African American fiction writers. Visit www.descooper.com to learn more about Ms. Cooper and her writing. An artist, cultural strategist and community organizer in Detroit. Ash works with statewide nonprofit Creative Many to develop professional practice workshops and seminars for artists across the state – including the Kresge Artist Fellows. Serving on local and national review boards and juries is part of Ash’s work to uplift the work of Detroit’s creative practitioners – herself included – to facilitate cross geographical and cross sectoral exchange. Ash’s community organizing work sits at the intersection of art, design, and the environment. A member of the City of Detroit’s Green Task Force and Zero Waste Subcommittee, and co-founder of Greige Gardens – a fiber and dye garden in New Center, Ash works to communicate the importance of creativity as a tool for awareness and change. This is illustrated in Ash’s own creative practice, where she combines plant-based fibers – grown and hand processed in her lab – with found objects to create sculptures and installations reflecting urban experiences. Ash will continue exploring fiber and textile production as a recently admitted MFA student in Cranbrook Academy of Art’s Fiber department. An artist (mixed media, multimedia, performance), curator and arts organizer. Her work lies at the intersection of art, activism and personal reflection, and draws from her background in political science (B.A., University of Colorado) and law (J.D. with honors, University of Washington). Previously based in New York, Christina co-founded Bushwick Open Studios and Arts in Bushwick, and was the Managing Director of Chez Bushwick, a Brooklyn nonprofit dedicated to the advancement of interdisciplinary art and performance. Christina is the deputy director of Kresge Arts in Detroit, and co-director of Spread Art. President, Volterra-Detroit Foundation, Associate Professor, University of Detroit Mercy School of Architecture. Architect and artist. Giovanna Galfione is a licensed architect in Italy, where she practiced for 15 years before moving to the USA in 1994. Her work –primarily in Florence and for public clients– consisted of master planning and urban design, institutional, mixed-use and social housing projects, and adaptive reuse of historic buildings. During her time in Italy she also started her ongoing collaboration with Rossiprodi Associati . In 1996 she was a founding partner of RBGC – Architecture, Research, Urbanism – in Charlottesville VA. She was lead designer for renovations, additions and new mixed-use infill buildings in Charlottesville’s Historic Districts, as well as for residential Planned Unit Developments and community design projects with local developers and non-profit groups. In 2010 she designed the first certified Passive House in Virginia. Director, Volterra-Detroit Foundation, Professor of Architecture and Former Dean of the University of Detroit Mercy School of Architecture. He represents the architects of Michigan on the national American Institute of Architects Strategic Council and is a 2014 AIA Richard Upjohn Fellow. For the past several years he has been leading tours to Volterra for the AIA continuing education credit.